Members of the ErbB subfamily of receptor tyrosine kinases are important regulators of normal mammary gland physiology, and aberrations in their signaling have been associated with breast tumorigenesis. Therapeutics targeting epidermal growth factor receptor (EGFR = ErbB1) or ErbB2 in breast cancer have been approved for clinical use. In contrast, relatively little is known about the biological significance of ErbB4 signaling in breast cancer. This review focuses on recent advances in our understanding about the role of ErbB4 in breast carcinogenesis, as well as in the potential clinical relevance of ErbB4 in breast cancer prognostics and therapy. The authors would like to warmly acknowledge the efforts of the International Genomics Consortium’s (IGC) Expression Project for Oncology (expO) for generation of some of the breast cancer data utilized in this study. Work in authors’ laboratories has been supported by Academy of Finland, EU-EPITRON (LSHC-CT-2005-518417), Finnish Cancer Organizations, Marie Curie Canceromics (MEXT-CT-2003-2728), and Sigrid Juselius Foundation. Stern DF. ERBB3/HER3 and ERBB2/HER2 duet in mammary development and breast cancer. J Mammary Gland Biol Neoplasia 2008. DOI 10.1007/s10911-008-9083-7. Hamburger AW. The role of ErbB3 and its binding partners in breast cancer progression and resistance to hormone and tyrosine kinase directed therapies. J Mammary Gland Biol Neoplasia 2008. DOI 10.1007/s10911-008-9077-5. Jones F. HER4 intracellular domain (4ICD) activity in the developing mammary gland and breast cancer. J Mammary Gland Biol Neoplasia 2008. DOI 10.1007/s10911-008-9076-6. Muraoka-Cook RS, Feng S-M, Strunk KE, Earp III HS. ErbB4/HER4: role in mammary gland development, differentiation and growth inhibition. J Mammary Gland Biol Neoplasia 2008. DOI 10.1007/s10911-008-9080-x. Howard BA. The role of NRG3 in mammary development. J Mammary Gland Biol Neoplasia 2008. DOI 10.1007/s10911-008-9082-8. 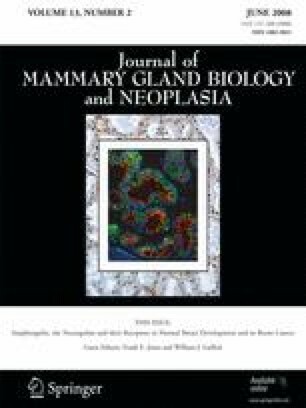 McBryan J, Howlin J, Napoletano S, Martin F. Amphiregulin: role in mammary gland development and breast cancer. J Mammary Gland Biol Neoplasia 2008. DOI 10.1007/s10911-008-9075-7. Sternlicht MD, Sunnarborg SW. The ADAM17-amphiregulin-EGFR axis in mammary development and cancer. J Mammary Gland Biol Neoplasia 2008. DOI 10.1007/s10911-008-9084-6.